AIRCEL, a pan-India GSM Mobile Service operator with a subscriber base of over 50 million, today introduces an innovative way to connect to your family and friends anywhere in the World on Facebook without GPRS or Internet, through the new Facebook Voice Updates service on Aircel Mobile. For the first time, Facebook Voice Updates on Aircel lets people connect to their family and friends on Facebook in their own voice, even without Internet/ GPRS/ 3G access on their mobile phones, which makes it an easy access for a large audience anytime anywhere. Moreover there is nothing like connecting in your very own voice which can express volumes where sometimes words fail…. 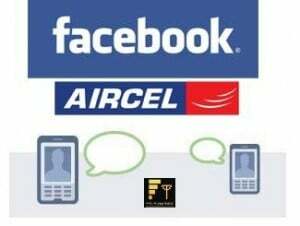 One can now easily find and connect with new friends using Facebook Voice Updates on Aircel – creating a much richer Facebook experience on their mobile phones. The product is easy-to-use – for example, to broadcast what you’re up to today, simply dial a short code 51555 to Record your voice message, and post it as your status update on Facebook. Your friends will then receive an SMS alert about your new status update, to which they can reply with their own voice updates on Aircel. According to our exclusive sources in Aircel, This optional Value Added service will be available to all Aircel subscribers by tomorrow i.e. 14th January 2011. The charges will be Rs.5 for Unlimited Access, valid for 7 days from the date of subscription. This indeed opens a world of possibilities for all to connect, share, and socialize in a quick and more personal manner which spells efficiency as you multi-task your way through various activities during the day. Also, Facebook Voice Updates on Aircel does not require access to mobile internet, which makes it more user- friendly and provides larger access. Mr. Gurdeep Singh, COO, Aircel stated, “At Aircel it is our constant endeavor to Innovate and bring the best to the consumer which enables the consumer to better his lifestyle and live SMART. Convergence is the way forward as it opens a world of possibilities. Facebook Voice Updates on Aircel is a step in that direction which helps both the business community and the youth to connect efficiently, be it a celebration or an emergency. It is an honor indeed to be working with Facebook and making this possible for the very first time”. Please improved your mobile networks in bihar circle otherwise if mnp launch to bihar circle then You will loose many of your existing customer.